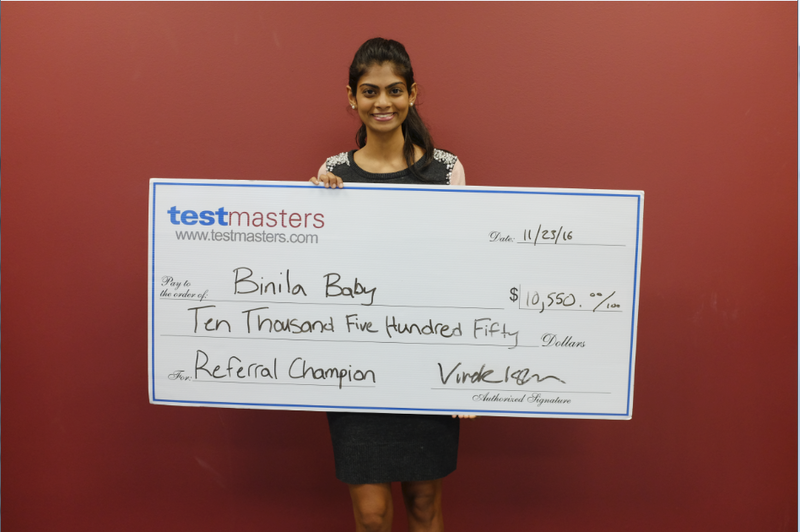 HOUSTON, TX (November 30, 2016) Binila Baby, sister to multi Referral Champion Siby Baby, has set a new record for most referrals accrued in the shortest period of time. From April 2016 to the present, Binila has referred over 230 new students to Testmasters. In addition to setting a new precedent, and hopefully a recurring family tradition, Binila has earned a sizable referral bonus. Including bonuses, Binila will receive over $10,000 for her efforts, which does not include bonuses she may become eligible for in the next quarterly distribution. The Referral Program is simple in nature. Former students are able to refer new students to Testmasters using a unique coupon code. For every new student referred to Testmasters, the referring student receives $25, and in turn the new student receives a $25 discount to the cost of their course. For every 20 students referred to Testmasters, the referring student receives a $1000 bonuses.